While the population of over 100,000 is not staggeringly large, Missoula is the second largest city in Montana and home to the University of Montana. That means, of course, that it hosts all the big box stores that we know and love, and have missed during our journey across the more rural areas of the northern Great Plains. We knew that our time in Missoula would include plenty of shopping for groceries and other supplies. But in the course of sampling lots of Montana-made beer during our time in the state, we noticed that many of our favorites were brewed in Missoula. After a tiny amount of research (i.e., googling “Missoula breweries”) it became apparent that the theme of our visit to the city would be beer, even though Missoula also has a vibrant scene for art, music, and dining. We visited a different brewery nearly every day during our stay in Missoula, but we still didn’t manage to visit them all. Everything we tried was interesting, authentic, and local, and we loved the experience. It provided an excellent structure to a week that was otherwise filled with errands, shopping, repairs, and other tasks. 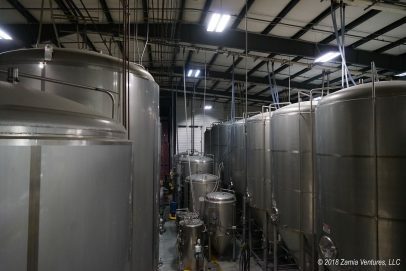 Bayern Brewing is the oldest continuously-operating brewery in Missoula, and the owner/brewmaster is a native of Bavaria who trained in Germany and brews under the requirements of the 1516 Bavarian beer purity law (the Reinheitsgebot). This means all the beer is made with only four ingredients: hops, barley, water, and yeast. There is no huckleberry beer to be found on the menu here! Instead, the brewery produces an incredible variety of different beer types ranging from light, fresh Pilsener and Helles to rich dark beers like their Dragon’s Breath and Schwartzbier. We thought every single one was excellent, and the variety is made even more impressive with the knowledge that the full spectrum of flavors is produced by manipulating the same four simple ingredients. In addition to the excellent beer, what made Bayern such a hit with us was the cafe, which serves a menu bursting with classic German pub foods. The use of locally sourced pork and fresh sausages is what really makes the food stand out as authentic. I couldn’t eat German food every day of the week, but when done well it is just such a treat to enjoy these savory dishes. There were so many tempting options that we were genuinely challenged to choose, and ended up eating lunch here twice just so we could sample a bit more of the menu. The delicious food we enjoyed during our visits included jägerschnitzel with spätzle, currywurst, landjäger, bratwurst, and frikadelle. The meats were outstanding and the sides of sauerkraut, warm German potato salad, and cucumber salad were all top notch. 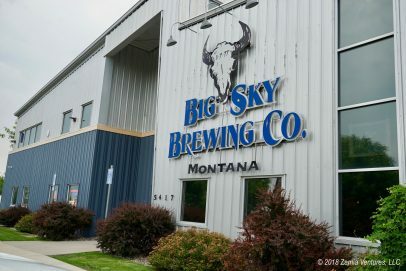 The only Missoula brewery that offers tours of the brewery is Big Sky Brewing, which is the largest of the bunch and home of some of the most popular brands in Montana, including (beloved by us) Moose Drool Brown Ale, Trout Slayer Wheat Ale, and Big Sky IPA. We made sure our visit to the taproom coincided with one of the two tour times (Tuesday and Thursday at 3 p.m.), and loved getting the behind-the-scenes view of the brewery operation. This was probably the best brewery/distillery tour we’ve taken so far in our travels, mostly because it was so authentic. Our guide was not a professional tour guide or a perky intern thrilled to be decked out in company apparel. Instead, our guide was a veteran employee (with the company since 2005) who supervises the bottling and canning operation. Thanks to his long tenure and management position, our guide was able to expound on everything from profit margins on draft vs. cans vs. bottles to how the company selects the suppliers for its malts and hops. The tour took us right through the production areas where all of the actual beer is made, not just a make-believe set designed for tourist photos. We learned that employees receive, as a perk, two free cases of beer per week and the right to sample any rejects from the packaging line (e.g., underfills) while at work. We, as tour participants, were invited to grab rejected cans from the canning line as it whizzed past us. The kids on the tour were encouraged to pull empty cans from the pallets stacked to the roof, to keep as souvenirs. The tour was quite different from the Toyota factory tour in Kentucky, in the sense that visitor safety didn’t seem to be a big priority, at least not if it might interfere with fun. The brewery’s liability management policy appears to be a verbal warning to not touch anything on the tour. This was sound advice, since we were standing right next to boiling kettles and fast-moving machinery throughout the tour. While grouped along the canning line observing the machinery at work, we were standing in a shallow river of overflowing beer and sprayed water that consistently flowed along the floor. It was a little weird standing around on the small production floor as employees zipped by on forklifts, knowing the men with huge beards driving heavy machinery were probably all slightly buzzed. We also enjoyed hanging out in the tap room and sampling the variety of beers. Big Sky’s products cover a much wider range of styles than Bayern, and it was interesting to taste such markedly different beers in quick succession. The brewers at Draught Works are wildly creative about their beer. My impression is that they will try anything once, no matter how unusual the flavor combination may seem. As a result, this was the brewery where we tasted the most one-of-a-kind beers, in a very fun industrial setting. Draught Works has developed a bit of a specialty in sour beers. The sours on tap during our visit included somewhat normal flavors of lemon and blood orange, as well as the completely bananas Tomatillo Sour. This beer absolutely had the flavor profile of salsa, with notes of tomatillo, jalapeno, cilantro, and tropical fruits, which was really interesting but also really surprising to experience in a beer. Some of the other unusual offerings included a cream ale that’s brewed with flaked corn and lactose to create a sweet and milky taste, several IPAs with strong flavors of citrus or other tropical fruits, and a dark oatmeal stout that claims to share a place of origin with Guinness stout. All the beers were extremely interesting, but I also would probably not be able to enjoy more than one in a single sitting. It’s sort of like the pumpkin beer that is ubiquitous in the fall — the first one is unique and enjoyable, then the experience goes downhill from there. Last but not least, we also visited Kettle House Brewing Company to try out their beers. We had seen several of their brands for sale in supermarkets across Montana, but frankly we were too afraid to purchase 6-packs of products with offputting names like “Fresh Bongwater Hemp Ale” and “Cold Smoke Scotch Ale.” Visiting one of the Kettle House’s two taprooms in Missoula gave us the perfect opportunity to sample these and other beers, which we actually liked quite a bit. The Cold Smoke in particular was incredibly smooth and pleasant to drink. While we loved every aspect of our tasting sessions, finding great dark beers at all the breweries we visited was definitely a highlight for us. Imagine Nation Brewing. A brewery specializing in New England style IPAs with lots of hops, which pairs its brewing activities with community building work. Missoula Brewing Company. A new company has started operating in the historic facility that produced Highlander Beer beginning in 1890, restoring part of Montana’s brewing heritage. Tamarack Brewing. 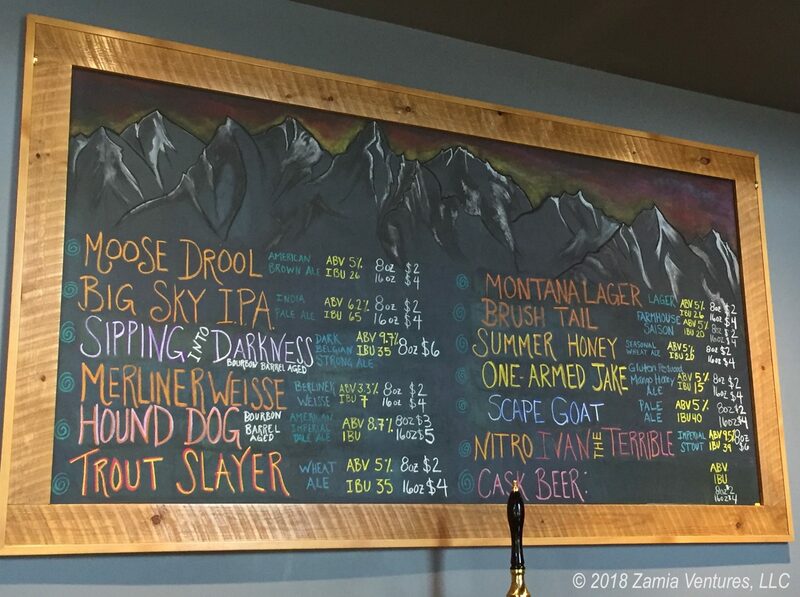 The brewery is located a short distance north of Missoula in Lakeside, on the west side of Flathead Lake, but there is a taproom in downtown Missoula near Caras Park. Great Burn Brewing. A super micro brewery making beer in tiny batches of 5 barrels. We love interesting museums and tours, and we jumped at the chance (groan!) to learn about smokejumpers in Missoula. We all know that firefighters are slightly crazy, rushing into burning buildings when every natural instinct is to run away. Smokejumpers take the crazy to a whole new level, since they (a) fight unpredictable wildland fires with virtually no outside support and (b) jump out of planes in order to reach the fires. The smokejumpers are sort of like the Special Forces of firefighting. They are all highly skilled and experienced wildland firefighters, and then to become smokejumpers they learn how to parachute themselves and their gear down to remote areas. Missoula is the site of a smokejumper base as well as a fire research center that is focused on wildland fires, all under the umbrella of the U.S. Forest Service, and we spent a fascinating morning at the visitor center and touring the base. The fire research center has made a lot of important contributions to understanding how fires grow and develop, and also helping develop materials and tools like Nomex and heat-reflective personal safety tents carried by all wildland firefighters. Smokejumping is so unusual — there are fewer than 500 smokejumpers in the US — that the team members make most of their own uniforms from the specialized fabrics developed by the fire research center. Like any fire station, the smokejumper base operates at full readiness during fire season. That means that a plane will take off with the assigned team of smokejumpers and all their gear within 10 minutes after receiving a fire call. The gear boxes are dropped by parachute as well, and must contain all the food and tools that the team will need while putting out the fire, including equipment for felling trees and creating fire breaks. Most of the food is freeze dried, but Spam is apparently a big delicacy and a beloved part of smokejumper culture. The smokejumpers practice Leave No Trace, which means that once the fire is put out, they will hike out of the forest carrying all their gear — including parachutes, jumping suits, tree-climbing gear that’s used to get up or down trees if the chutes land in trees, firefighting tools, any leftover food, and any trash. You’d think that after putting out remote fires these men and women deserve a better reward than hiking for miles to the closest road over uncharted terrain while carrying hundreds of pounds on their back. When they return, the smokejumpers dry their parachutes, examine every square inch for any tears or other damage, and repack the parachutes for deployment on a future mission. I’ll bet they also spend plenty of time on physical conditioning, to be prepared for the extremely grueling conditions they endure when called out to work. Just the minimum strength and endurance qualifications for the job — including dozens of pullups and pushups, and running a mile in 7 minutes and 20 seconds — make it obvious that we could never handle any portion of the duties of this unusual job. Missoula is home to an Airstream dealership, the first that we’ve run across since our skylight mishap in the Dakotas. In anticipation of our arrival in the area, we had the dealer order the part we needed to replace our skylight and dome, and one of our tasks while in town was to install the replacement. We learned from our blowout and repair experience, and therefore did not follow the manufacturer’s ridiculous instructions to simply attach the skylight with double-sided tape. Instead, we created a whole new seating for the skylight with weatherstripping foam and then explored various options for adhesives. As it turned out, our main adhesive component was once again the magical Flex Tape, this time in a stylish gray color to complement our trailer. Here’s hoping the new skylight lasts longer than the first one! We also replaced one of our USB outlets, which had failed, demonstrating that some basic home electrical repair skills are incredibly helpful when living in a trailer. Pulling the trailer at high speeds, especially on bumpy roads, subjects it to earthquake-like conditions, which means that things are always managing to become disconnected, dislodged, or damaged. It’s sort of like owning a historic home. In both cases, you end up on a first name basis with the team at your local Home Depot. (Ask us how we know.) Other fun tasks we accomplished included defrosting our freezer and completing multiple rounds of laundry. In addition to all our errands and beer tasting, we enjoyed checking out the Missoula area. The scenic downtown is full of historic buildings that are home to a vibrant commercial community. There are several galleries showing fine arts and crafts made by local artisans, and we were very impressed by the quality and variety of the local art. Living in a tiny space naturally puts the brakes on any purchases of large art, otherwise we might have ended up buying several pieces that we loved. It was great to see an unusual form of retail establishment: an independent book store! I thought Amazon put them all out of business a decade ago. The very walkable downtown area is adjacent to the Clark Fork River, and the riverfront has been kept open to the public through an extensive network of parks and trails along both sides of the water. Downtown’s Caras Park is home to a very cool hand-carved community-supported Carousel for Missoula and other family-oriented destinations. 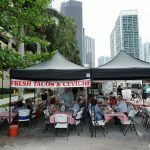 The downtown area also supports several theaters that show independent and art films, and downtown shop windows all featured posters for the many, many music festivals and performances that occur in the area during the summer. Overall, Missoula struck us as a weirdly monochromatic college town, filled with bearded hipsters, mountain bikers, beer, a large art community, live music, and an overwhelming preponderance of white people. There is also plenty of hiking available in the area, which we needed in order for our exercise regimen to somewhat keep pace with our beer consumption. We didn’t manage to fit in as much hiking as we might have liked, but one day we headed out to the nearby Rattlesnake National Recreation Area, which basically backs up to a suburb of Missoula. We selected some promising loops from the hiking/biking trail map, and enjoyed over 7.5 miles of mostly empty trails, seeing fewer than a dozen mountain bikers and only one other hiker on the trail. During our travels we’ve often found that state parks offer the best chance to camp in beautiful settings at an affordable price. In Montana, our experience has been quite different. Montana state parks are priced to strongly favor residents, with nonresidents paying an extra $12 per night to camp between the camping fee and the daily use fee. So it would cost us, as non-residents, $34 per night to park in a basic campsite with no hookups (no electricity, no water, etc.) in a Montana state park, unless we purchased an annual pass from the state. That’s just a few dollars less than it would cost us to stay in a private RV park with full hookups. As a result, our camping in Montana has involved camping on federal lands (national parks, national forests, bureau of land management lands) for remote, beautiful, and affordable camping, interspersed with stays in private parks when we are in cities. The private park we called home in Missoula was Jim & Mary’s RV Park. Although we never met Jim or Mary (and question whether they really exist) we loved the bountiful flower beds as well as the super-clean laundry facilities. Ken had to work hard to keep me from volunteering to help out in the on-site greenhouses where all the seasonal plants are grown. Our site, close to the greenhouses! We really enjoyed our time in Missoula, but it was, as expected, a busy week. Now we’re headed back to the quiet of the many nearby national forests to regroup, relax, and hike off all that beer that we enjoyed! Hard to believe they make a beer that has 9.5% alcohol content with a name of “Ivan the Terrible” which seems quite fitting. I hope you did not ingest too much of that libation. The menu of German dishes at Bayern brewery cafe sounds delicious and gives me a craving for a taste of some of these. Sounds like you enjoyed your stay in Missoula. Luckily we only tasted the sample size (4 ounces) but it was delicious! Super dark but also super smooth. Of course, we loved just about ALL the beer in Missoula, which is why we need to do a lot of hiking next week. It’s definitely a cool town. We’re certainly willing to do the preparatory research necessary to determine whether such a venture could succeed.